For those not in the know, the Cell Games Saga was the intended original ending to Dragonball Z, with Goku dying and Gohan taking over as defender of the Earth. There's a nice echoing of the end of Dragonball in that, with Kami trying to pawn the Guardian job off to Goku after the defeat of Piccolo Jr. With Cell perfected, he declares a tournament where each warrior may battle him in turn, with the survival of the planet as the prize; again, nice repetition of themes there. The whole of season six is filled with flashbacks, references to past events and great cameos like Mercenary Tao and King Furry. Seriously, were you aware that Dragonball Earth is ruled by a Monarch? The saga also has something rarely seen in Dragonball Z; downtime. There a several whole episodes of the characters, Goku and Gohan especially, taking time off and not doing much of anything. So let's talk about the elephant in the room; "Ascended" Super Saiyans. In the Majin Buu Saga, we're introduced to the concept of Super Saiyan levels, one, two and three, all of which sounds pretty dumb, not surprising as Goku is the one explaining it. I hate Super Saiyan three and the very concept that it is a series of levels to climb. When Goku, and later Vegeta and Trunks, reach the level of Super Saiyan, they're fulfilling an ancient prophecy and also breaking the curse put upon their violent race. With the idea that Gohan surpasses Goku to be the new defender of the Earth, Gohan's "Ascending" beyond Super Saiyan is a nice touch, it just leads to dumbness in Majin Buu Saga and beyond. 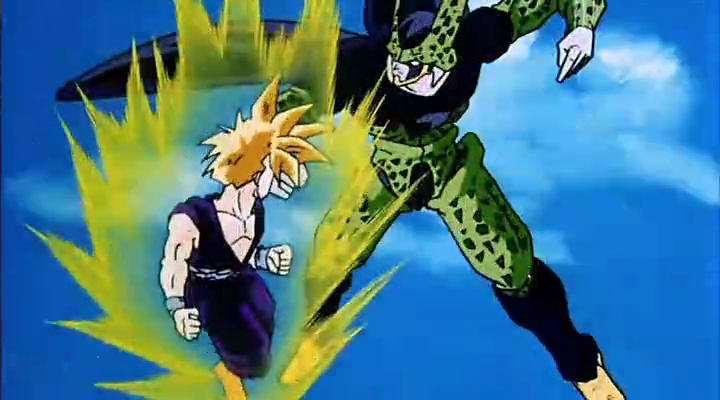 So I haven't really mentioned the actual fight yet, when Gohan and Perfect Cell finally go toe-to-toe. It's actually pretty good, it does drag in parts, especially when Gohan decides to be dumb for about five episodes straight and let Cell live, but it has much lest posturing than other DBZ battles and some really good moments. Ascended Gohan punching Cell so hard that Android 18 pops out is pretty classic, as is Gohan still keeping Cell on the ropes with one arm broken. The one thing that disappoints me with the Cell Games Saga is that it's not actually the end of Dragonball Z. I much perfer a programme to have a decent and well though out ending (Luther, 30 Rock, Breaking Bad) rather than limp on into infinity. Free the Future would have been about the best ending DBZ could have had and it's a little sad it didn't stop there. Way back in the early 2000s, I got into Heroclix pretty hard when it first hit the shelves. It was my first flirtation with supers gaming and probably the biggest jump I'd made away from Warhammer 40,000 at the time (purchase-wise, I had played a bit of DBA and NATO Spearhead). Much like what would happen five or so years later with Warmachine, tournament play finally killed my enthusiasm for Heroclix, as well as the artificial rarity, and I pooh-poohed the game for a fair while after that. Despite this, I did keep buying the odd loose clix, if it was of a character I really liked or could find use in another miniatures game; I had, at one stage, grand plans for an Ultimates-themed 40K Daemonhunters army, with Nick Fury as an Inquistor and Captain America as a Grey Knight, but I could never get the figures to put it all together. It was then that I first rebased and repainted clix and I found that I got a lot of satisfaction out of it, so, even though I didn't have a project in mind, I just kept going with it. A few years after that, I discovered SuperSystem and the rest, as they say, is history. These days, I'm spoiled for choice when it comes to miniatures for generic superheroes, I've lost track of the number of makes and manufacturers that have gone into my "Equalisers" setting stuff and I'm still yet to get any of my Crossover stuff on the table. However, when it comes to the big name heroes for my Ultimate Alliance games, I still find myself turning to Heroclix more often than not. Despite the quality of sculpts varying from reasonable to abysmal, the pre-painted atrocities and the above mentioned problems with rarity, the fact is, if you want a Marvel or DC hero, you'll find it in clix, probably for next to nothing. Knight Models has hit in a big way with their Batman/DC and Marvel ranges, but anyone who has bought one of their products will tell you about the fiddly assembly and poor cast quality. When I'm asked what the best way to get into supers gaming is, I say download the SS4 quick-play rules and grab a Heroclix booster; in for under $20. Marvel and DC are still the biggies when it comes to Heroclix, but I have plenty of the Indy clix and whilst I never bought any Halo, Assassin's Creed or Bioshock clix, I did see them around. Also, TMNT is coming out, which is pretty damn cool and should fill out a fair few slots on my wish list. What surprises me most about TMNT clix is just how long they've taken to arrive. As a writer and someone who has worked in the gaming industry, I get that miniature wargames is hardly an obvious choice for merchandising and that licensing is a legal minefield, but Heroclix is one of those weird entities that seems to have defied all expectation. Think about how much tooling molds for plastic miniatures must cost, even with a large scale production, and now consider that WizKids make hundreds of new molds every year; they must be doing ok to still be operating more than ten years later. Until recently, I had only been exposed to Image's early 1980s and 1990s work, which is, frankly, pretty woeful as Rob Liefeld is the driving force, both artistically and in terms of writing and he is pretty damn crap at both. Ok, so Deadpool came good in the hands of other writers, but that was clearly the exception rather than the rule. Then I started reading Invincible. Holy crap that comic is amazing. Like Jaime Reyes Blue Beetle and Ultimate Spider-Man amazing. Here was a fully fleshed-out world, populated with a variety of heroes that "felt" like Marvel or DC but was still unique and fresh. Forget Spawn and all that Youngblood crap; Invincible, Guardians of the Globe and Savage Dragon alone would provide a great basis for a series of Clix sets. Plus Spawn and all the other teenage power fantasy BS would draw in a few people as well. Correct me if I'm wrong, but I think King still owns the rights to Phantom, Mandrake and Flash Gordon, plus the associated characters and even other "heroic" characters like Prince Valliant and Jungle Jim. Ok, so there's not a great deal of opportunity for growth, but at least there are more characters than the Watchmen set. Thanks to the 1980s DOE cartoon, there's a substantial cult following for these characters, and with superheroes being the big thing in pop culture at the moment, may as well strike while the iron's hot, right? Seriously, Octobrain clix, I want one. Much like TMNT, why is this not a thing already? There's a new DBZ film and series on the way, the relaunched CCG is going gangbusters and DBZ video games continue to sell like crazy in Japan and the USA. Akira Toriyama is famously difficult, but has shown that he'll do pretty much anything for truckfulls of cash. When asked, as I have been more than once, how I would do DBZ as a minis game, I say that Heroclix is about the only existing system I can see pulling it off. Plus, there's hundreds of characters, many with multiple forms or costumes, so sets could go for years. It would be like printing money; watch Super Saiyan God Goku go for four figures on eBay, especially if he's a convention exclusive. And why not? Nintendo will slap Mario and Co on pretty much anything these days the the punters lap it up. Have you seen Amiibos? I know people who don't even own a WiiU or DS that collect the damn things and keep them in the blister packs. Can you imagine how fast Nintendo Clix would sell? The best thing is, all Nintendo would have to do is sell the license and approve designs, then sit back and rake in a percentage. Nowhere near the top of my list, but still, the possibilities are pretty huge. So that's my (amateur) take on the future of Clix sets; probably more an exercise in fantasy than prescience, but that was what I was going for anyway. How about you, what boxes would you like to be cracking? CW DC sets? Mortal Kombat? Vallient Comics?